Clementines always remind me of the holidays. I eat them to ward off my annual cold, there is always one lurking in the bottom of my Christmas stocking, and there are usually several rolling around the holiday table. What to do with this abundance of citrus fruit? I turned to Nigella Lawson for her Clementine Cake recipe after reading rave reviews from Smitten Kitchen and learning that the recipe doesn’t call for flour(?!) or oil(?!?!) or butter(?!?!?!). Let’s just say that the overeating/lounging situation has gotten a little out of hand for this kitchen. 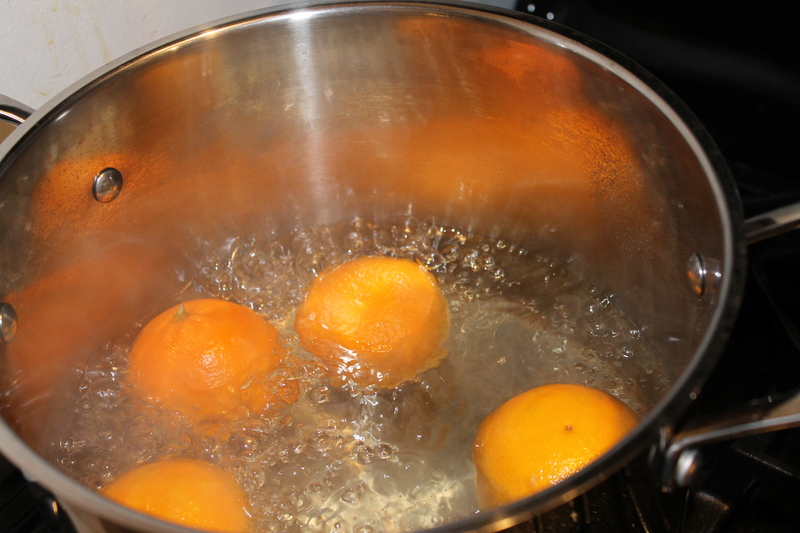 Put the clementines in a large pot, add just enough water to cover them. Bring the water to a boil, and let them cook for two hours. Most of my water boiled off so I ended up mixing the clementines around a bit so they wouldn’t burn. While the clementines are simmering away, get the rest of the ingredients ready to go. I couldn’t find ground almonds so I ground some myself in the food processor. A couple of tips I found online included freezing the almonds beforehand, and adding just a bit of sugar to the almonds in the food processor for a fine, flour-like consistency. In a large bowl whisk together the eggs. Add the sugar, ground almonds and baking powder and stir to combine. When your clementines are done cooking, slice them into quarters and remove any seeds that may be inside. Pop them into the food processor and pulse until they are finely chopped but not pureed. Allow the clementines to cool before adding them to the rest of the cake batter. Grease and flour an 8″ springform pan. 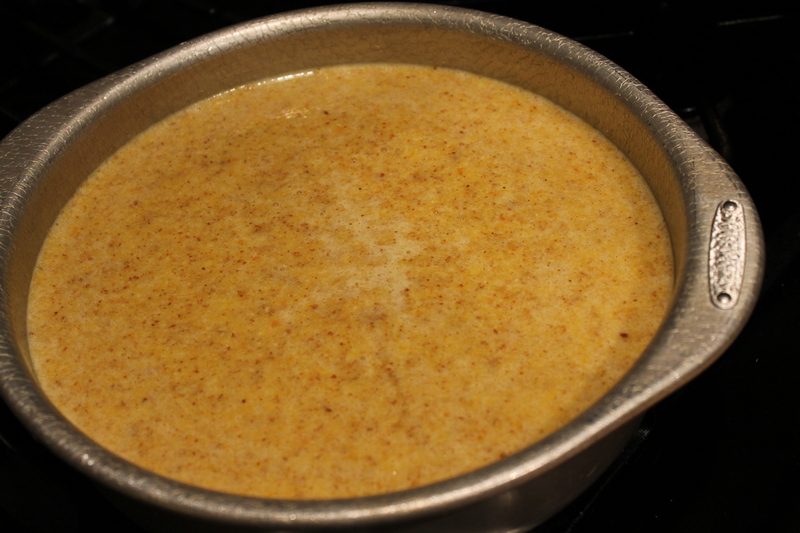 Or a 9″ round pan as I used (incorrectly…) and pour the batter in. Pop the cake in the oven for 60 minutes — covering it with foil after about 40 minutes so the top doesn’t burn. 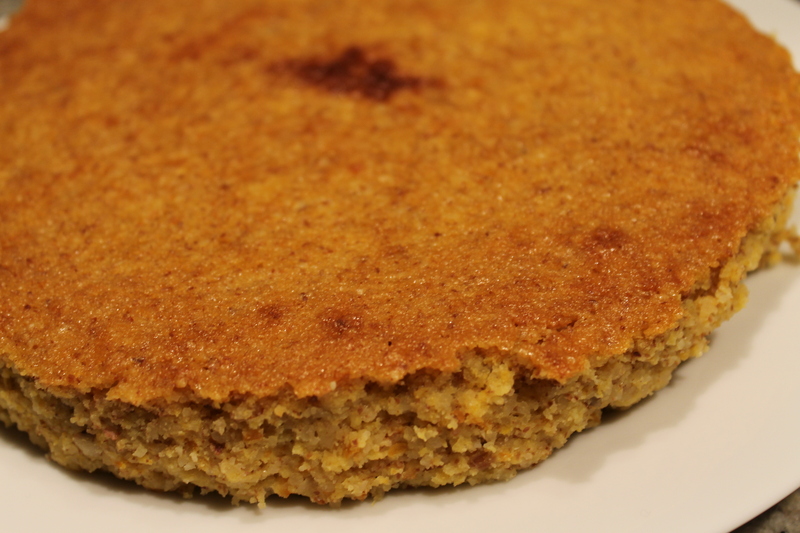 Allow the cake to cool in the pan (or don’t allow it to cool, as I did…), then turn out on a rack. Serve immediately and enjoy! Nigella says that the cake gets better after a day, I’ll have to test her theory tonight! My impatience lead to a rather sorry looking (but still moist and delicious!) 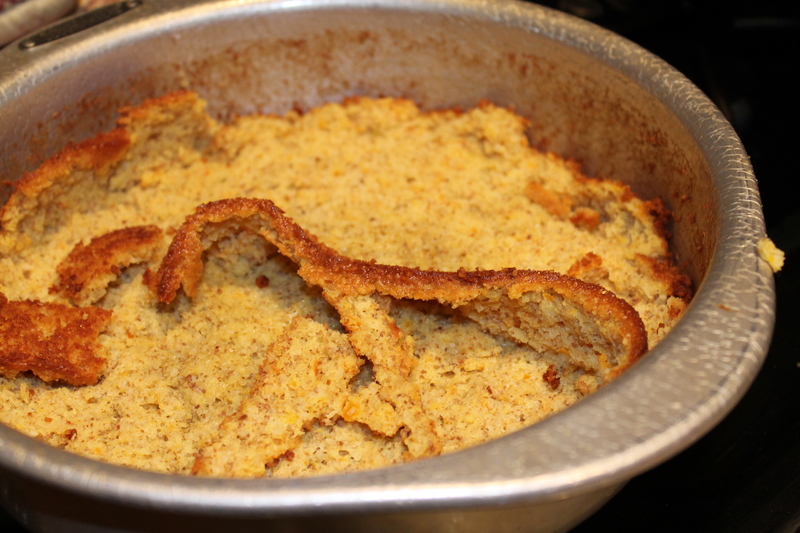 cake… so I will resolve to be better about cooling, correct pans etc… in 2012. This entry was posted in Citrus, Eggs, Festive Cheer and tagged cake, Christmas, clementine, clementine cake, dessert, holiday, nigella lawson, smitten kitchen. Bookmark the permalink.